Since my last post – a lot of stuff happened, not the least of which was the passing of my grandmother. In the days after, I made a handful of quilt tops, mostly because I was just too sad and heartbroken to do anything else – and I needed something to devote my frazzled and overwhelmed attention to. 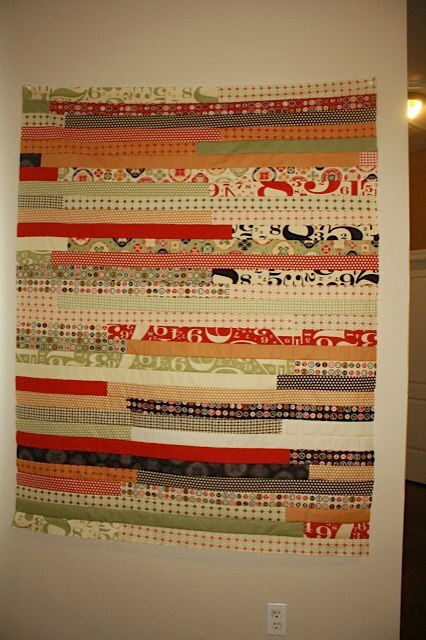 I would up making Racing quilts out of all the jelly rolls in my stash. I found them to be just what I needed. They were fun and came together so quickly and it was nice to feel like I accomplished something. Now that I had all these tops, I figured I should use one of them as my Christmas present for out family gift swap. The largest of the bunch was the most masculine – so that was the one that I decided to run with. Finishing quilts is not my strong point. 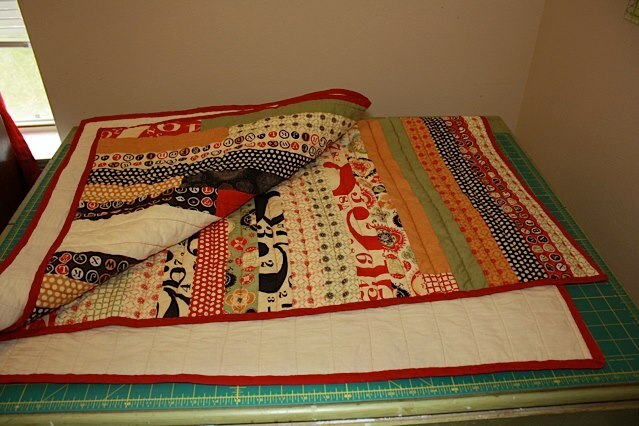 I have tons of quilt tops that I never get around to actually quilting and binding. Binding, ugh I don’t want even get started about how much I stress over binding. In the days leading up to finishing this one – I planned on cutting my binding out of this pretty black polka dot fabric. But once I started cutting and making my binding I quickly got frustrated and wound up just buying some bias tape from the store. I am very proud at how nice my sewing came out on the binding itself – so maybe next project I’ll master the cutting of the binding.